A ready to use application that splits and renames TIF, JPEG and PDF documents according to barcode value. The application reads documents from an input folder and creates new documents in an output folder. The original documents are not modified or deleted. The name of a new document is controlled by a template, which can include the original file name, barcode values and sequence numbers. Documents can either be left whole or split in sub-files according to barcode location. BardecodeFiler can be run from the command line and within scripts which can utilise imported settings. Licenses for the Desktop Only version (no Windows Service) range from $249 for a single user license to $99 with volume discounts. Every license comes with a years support and upgrade cover as standard. 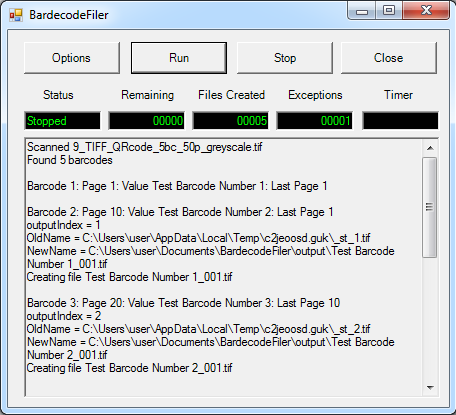 With over 10 years of development and refinement the BardecodeFiler application is the perfect, reliable, ready-to-use solution. If you are looking for the version that can run as a Windows Service then please click here. 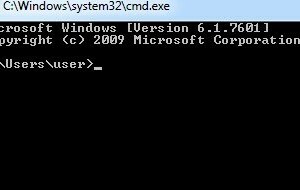 Run from the command line or Windows Scheduler. Use Regular Expressions for pattern matching. Timer function for regular processing. Read QRCode from an image. Reformat barcode information with Regular Expressions. Extensive advanced settings to suit a variety of needs. BardecodeFiler is a ready to use barcode reading application which reads documents from an input folder and creates new documents in an output folder. 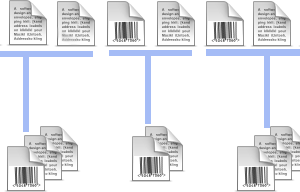 With a variety of split modes documents can be divided based on barcode position or at pre-set intervals. With Regular Expression functionality documents can be renamed using barcode values, date or time stamps or simply retain the original file name. 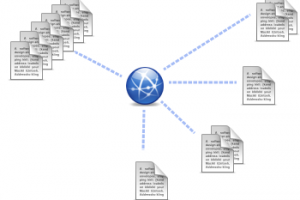 The BardecodeFiler application also retains full searchable functionality in PDF documents after splitting. It also contains a variety of options which can help improve read rates for more awkward barcodes. Read barcodes from images through the command line. BardecodeFiler can also be run in non-interactive mode using the command line (e.g. BardecodeFiler.exe settings.ini). Settings can be saved, exported and imported with ease to allow for a variety of set ups with the minimum of fuss. The application also has a hidden mode for seamless integration within scripts. With no development required the BardecodeFiler application is ready-to-use, and instant delivery of the license key after purchase means no delay. Prices start from $249 for a single license but volume discounts can reduce the price to as little as $99 per license. System Requirements: Windows 2000, 2003, 2008, 2012, XP, Vista, W7, W8, W10, .Net 4.0 or later. File Types: TIF, JPG, PDF Barcode Types: Codabar, Code 128, Code 2 of 5, Code 3 of 9, PDF-417, EAN-13, UPC-A, EAN-8, UPC-E, Datamatrix and QR Codes. Download now and evaluate for free! Evaluation licenses are supplied upon request. Don’t hesitate to get in touch if you have any technical or purchasing questions. We look forward to hearing from you.